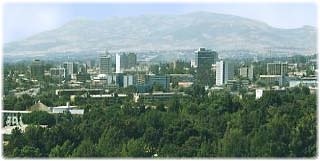 The International Neuroinfectious Disease Conference, sponsored in part by the ISNV, was held in Addis Ababa, Ethiopia, on February 27-28, 2010. The meeting covered topics relevant to neuroinfectious diseases and conditions prevalent in Africa, including HIV/AIDS, neuroAIDS, tuberculosis, cerebral malaria, bacterial meningitis, and viral encephalitis. In conjunction with the meeting, the ISNV supported local participants through ISNV International Travel Fellowships and a meeting speaker as an ISNV International Scholar. The ISNV also sponsored, in part, an outreach program to engage the Ethiopian community in matters related to HIV/AIDS and other communicable diseases. This conference was held following a 2-day course titled "Neurology for Non-Neurologists". The course, which was organized by Drs. James Bower (Mayo Clinic, Rochester, Minnesota, USA), Enawgaw Mehari (People to People, Inc., Morehead, Kentucky, USA), and the Addis Ababa University Department of Neurology, was offered on February 24-26, 2010, in Addis Ababa. View the conference brochure.